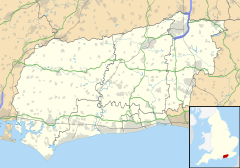 Easebourne (/ˈɛzbɔːrn/) is a village and civil parish in the Chichester District of West Sussex, England. It is half a mile (0.8 km) north of Midhurst, across the River Rother on the A272 and A286 roads. The parish includes the hamlet of Henley to the north. In the 2001 census there were 708 households with a total population of 1,717 of whom 785 were economically active. An electoral ward of the same name exists. This ward includes Lodsworth and at the 2011 census had a population of 2,492. There is one public house in Easebourne, the White Horse, and one in Henley, the Duke Of Cumberland. The Rother Inn closed in 1994 and the Holly Tree in 2004. Cowdray Park, to the east of the village, has a golf course, and is home to a first-class polo club. The parish church of St Mary is 13th century or earlier in origin. The parish includes the hamlet of Henley to the north. In the 2001 census there were 708 households with a total population of 1,717 of whom 785 were economically active. Adjacent to the polo grounds lie the ruins of the Tudor Cowdray House, built as a Tudor mansion with castle features. Started in 1520, it was completed by 1542, but was devastated by fire in 1793. It has not been occupied since. Easebourne Priory was built for ten Augustinian canonesses and was founded before 1238 by the de Bohun family who were from St. Ann’s Hill in nearby Midhurst. On the northern edge of Easebourne village on the A286 road Budgenor Lodge, recently converted into luxury flats, is the former Midhurst Union Workhouse which was opened in 1794 by a Gilbert Union of seventeen parishes. From 1835 it was run and enlarged by the Midhurst Poor Law Union, serving 26 parishes. Anti-apartheid activist Helen Joseph was born in the village in 1905. ^ "2001 Census: West Sussex – Population by Parish" (PDF). West Sussex County Council. Archived from the original (PDF) on 8 June 2011. Retrieved 26 April 2009. Wikimedia Commons has media related to Easebourne. This page was last edited on 18 October 2018, at 15:49 (UTC).